Individuals today spend more and more time using digital means to communicate and transact, be that sending and receiving e-mail, talking on a mobile phone, participating in a social networking site, buying music, booking vacations over the internet, or playing an online game. The complexity of the interaction between technology, personal consumption and the construction of identity in the virtual space is a growing area of research. Users of digital technologies have a wide scope for constructing their virtual identity. The mostly nameless and faceless environments of cyberspace create an ideal background for developing alternate identities or digital personae. At the same time, there is an alarming increase in the amount and quality of data generated, collected and stored in the digital world. The sheer amount of this data is alarming, but so too is its nature, which is ever more detailed and personal. The public and private spheres of existence are experiencing a progressive blurring of the boundary separating them. These developments create a new set of concerns relating to human identity, data privacy and protection. The notion of identity, both offline and online, is complex. It incorporates not only philosophical considerations but also legal and practical ones. Identity is what makes individuals the same today as they were yesterday (i.e. sameness), but it is also what makes them different from one another (i.e. uniqueness). Underlying identity is the distinction between the private and the public spheres of human existence, and as such, identity and privacy are forcibly linked. In practical terms, identity can include parameters such as a social security number, a date of birth, a job title, a bank account or a credit card number. Digital identity refers to the online representation of a user’s identity, and the identity of those the user is in interaction with (e.g. machines, institutions, other users, etc.). More specifically, it refers to the set of claims about a user or another subject made in a digital environment (e.g. during an internet exchange or a mobile transaction). Challenges for identity management in today’s digital world arise from, inter alia, the growing fragmentation of identity (e.g. the use of false identities), the lack of limits on the collection of identity parameters online, and unclear guidelines for the retention of data. 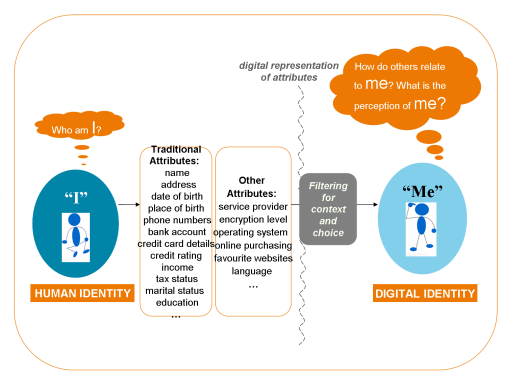 There have been calls for digital identity management to be based on the use of partial identities (or pseudonyms) depending on context and user choice. Discussions regarding the principles upon which digital identity management systems should be predicated are ongoing both nationally and internationally. Not only are security experts evaluating the need for a coherent identity scheme that would stimulate online interactions while protecting data and alleviating privacy concerns, but so too are lawyers, corporate strategists, and economists. Governments are also taking a greater interest in this area, particularly in an effort to thwart illicit activities and identity theft. Though the importance of digital identity mechanisms is finally being recognized, much work remains to be done. Information regarding individual identities is becoming an increasingly valuable commodity, and as a consequence, its protection and management are vital to a healthy and inclusive digital world. You can download the full chapter four: identity.digital now!